For a Limited Time! 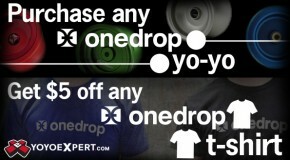 Purchase any One Drop Yo-Yo and get $5 off ANY ONE DROP T-SHIRT! ONE DROP YOYOS AND SHIRTS AVAILABLE HERE!